Climb to the top of the Hancock? Check. Scale to the top of the Aon Center? Check. Run across the 50-yard line at Soldier Field or around the warning track at U.S. Cellular? Been there, done that. Rappel down the side of one of Chicago’s skyscrapers? That’s a new one—even for me (and I still have to get my rear over to Willis Tower, too). But it’s an adventure that could be crossed off the bucket list next weekend. That is, if you’re one of the 80 or so participants daring to take the Skyline Plunge. 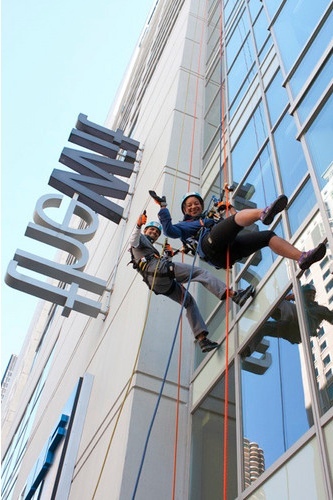 Dubbed Illinois’ first urban rappel, this daring challenge happens May 5 at theWit Hotel and benefits the Respiratory Health Association. RHA hosts some other exciting events—well, if tired legs and heavy breathing count—like the Hustle Up the Hancock and the CowaLUNGa bike tour to raise funds and awareness about lung disease, but the Plunge might take adventure to another level. Plunge participants rappel 27 stories down the hotel’s signature lightning bolt, 278 feet above State Street. Talk about a Cinco de Mayo to remember—don’t bragging rights, the adrenaline rush and the once-in-a-lifetime experience win over a few Coronas and some guacamole? I’d say sign me up even if I didn’t have relatives with lung disease and a grandma who fought through asthma. And hopefully those family members would pitch in for the fundraising, $150 entry fee plus a $1,000 pledge commitment, that should raise $85,000 for the Respiratory Health Association. Ready to tackle this adventure? There are still a few spots left for the sixth Skyline Plunge (contact RHA immediately if you want one), or you can always wait for No. 7, held in the fall. For more details on the Skyline Plunge, check out skylineplunge.org. And if you need more convincing, just check out these pictures from last year--the smiles tell all! Photo courtesy of the Respiratory Health Association.